Aerialist act atop Gaylord Hotel, 1954. Caption slip reads: “Photographer: Lapp. Date: 1954-12-21. Reporter: Dunn. Assignment: Aerialist act atop Gaylord Hotel. 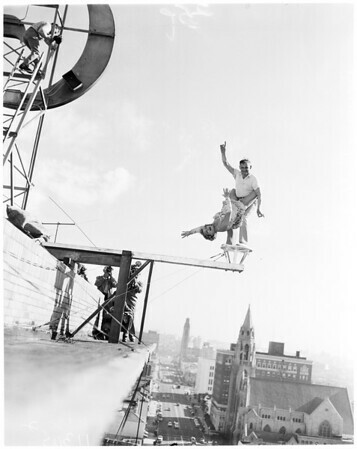 Benny and Betty Fox, on 18-inch platform, 10 stories above the ground”.